Year 2014 / 4 double cabins + 2forepeak cabins singles / 4 bathrooms / 8 persons. 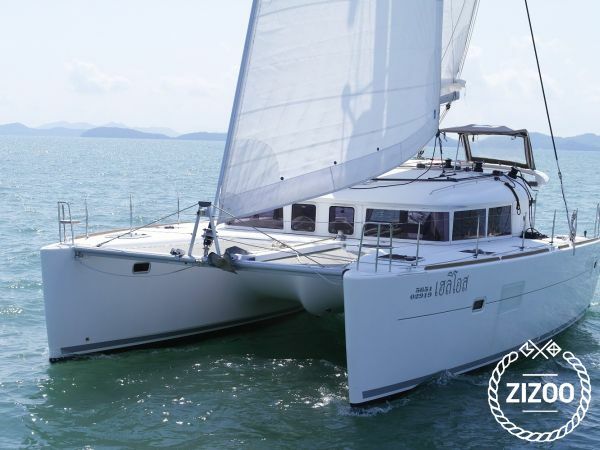 Lagoon 400 S2 - an excellent luxury cruise catamaran spacious both inside and out. It provides maximum comfort for 8 persons, spending a vacation sailing in Thailand. There are 4 double cabins, all with private bathroom and shower + 2 single bow cabins. Split system. 220V Generator. 7kW. Front cabin converted into twin or double. The spacious lounge has a 360 degree visibility and goes to the same level as the cockpit. Both spaces create a pleasant atmosphere for the evening entertainment. Easy handling, easy steering place, hard top over the cockpit, passes around the entire deck, and wonderful speed under the sail - are just some of the best features of the new model Lagoon. Charter a yacht in Thailand with Zizoo, and experience the diverse, green coastal landscapes, alluring islands, fascinating culture and flavours of the land. The sun shines bright from November through April, making Thailand a superb winter destination for sailors from Europe and North America.